surprisingly low—sometimes less than half the price charged in jewelry stores. However, don’t confuse our low prices with inferior quality! Let me just start off by saying how ..Amazing..this ring is. 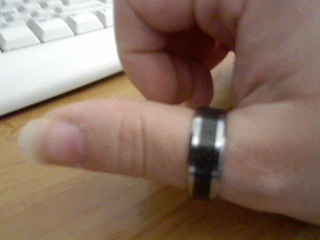 My husband got me interested in Tungsten Carbide rings shortly after our wedding 4 years ago. I didn't know THEN that he wanted one of these rings..Yeah I know he should have spoke up about it. But back then I didn't know there was such thing as a "Tungsten" ring of any sort.. I knew there was gold, silver, gold with diamonds, silver with diamonds and that's about all. My opinion about rings changed when I started doing research about Tungsten Carbide wedding bands. There are tons and tons of different shapes, colors, designs and ect.. I didn't know about! Talk about taking the wool off my eyes. It opened me up to a different experience. These rings are truly unbelivable. 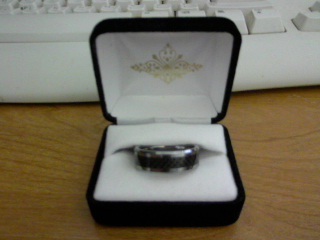 I went for the silver polished outlined tungsten carbide wedding band with the black carbon fiber inlay. I was not disappointed in the ring when I first saw it. It's the most handsome wedding band I have ever seen. Your husband/Fiance' will not be disappointed if you are thinking about buying this one. Unfortenatly I didn't relize how much weight my husband put on his wedding finger so this ring doesn't exactly fit. *Sigh*.. Did you know that Tungsten carbide is 4 times harder than titanium?..I had no clue! a Tungsten Carbide ring is perfect for any man in your life for the hard working car mechanic to the more office 9-5 worker If you need a durable yet elegant ring this is for you. Completely hypoallergenic our tungsten carbide rings will never turn your finger green or cause irritation to your skin. Includes 100% Money Back Guarantee, Ring Box and FREE shipping. Tungsten Fashions has a huge variety of rings at a low cost so not only will your husband be happy..So will your bank account! ♥ I receive no monetary compensation for this review. I was provided a Tungsten Carbide ring to try and give my honest opinion.